I love this dress. I love it because I love dogs. 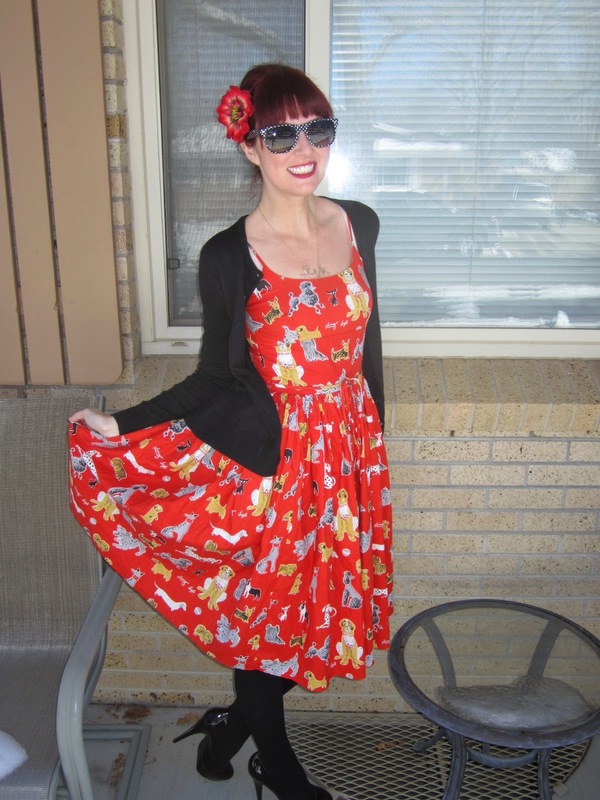 I love it because the print is so fun. I love it because Bernie Dexter is arguably my favorite dress designer. But I also love it because my mom bought it for me about a month after my surgery because I was starting to enter a pretty dark place about the surgery being a failure. Now, I'm not so shallow that getting a present makes everything in my life all better! But I'm also not above enjoying getting a really nice present-in good times or bad- either! It's double special too because she owns the same one, and it's kind of a testament to not only my mom having such fun style but that she likely gave me my love of clothing and a sense of taking pride in how I present myself to the world. This necklace is a touch more silly! 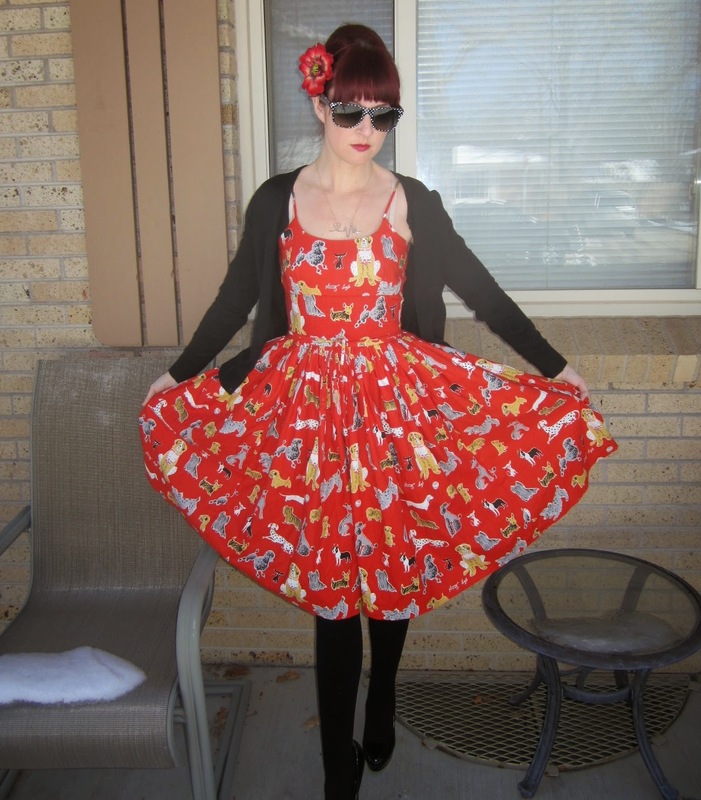 I saw it in January on ModCloth and just thought it would be too funny if I purchased it. 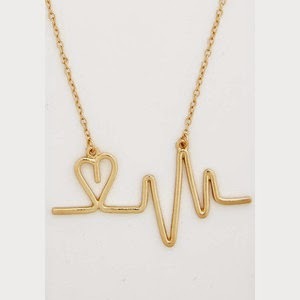 There's a lot of heart necklaces out there in jewelry land, but none that look like a heart next to an EKG chart or heart monitor of any kind! Knowing that this warped anniversary was the following month I knew I had to have it! (I admittedly have a sick/ironic/dark/cathartic sense of humor a lot of the time). So there you have it! One year down and here's the fashion to symbolize it! This is the last time I'll commemorate this day on this blog, and probably in my life, at least with any fanfare. I believe in acknowledging an important day in one's history, but I also believe in not rehashing things after a certain point too. I imagine I'll have more hiccups with my heart health that'll land me in the ER again- sadly sooner than later as if I make it past 2015 without a major SVT attack it'll be something of a miracle- and I may mention those events on IG or here on the blog depending on funny photo-ops or announcements that I may go MIA for a few days while I recover...but I do not wish to 'remember' this day anymore. It's time to move on. I posted this photo on Instagram in May. I look happy because smiling, I'm popping my foot so I'm clearly in posing mode, and I'm even rocking a slight tan from a recent trip to Miami. I look like the picture of health and happiness! What wasn't pictured? I knew I had to leave this event I was at sooner than later because I was experiencing symptoms of potential complications from my surgery that I was still at risk for. I only went to my friend's monthly happy hour because I needed the distraction to determine how bad the symptoms were versus in my head. By the time this picture was taken I was starting to get concerned because they weren't going away. I ended up going to the ER and luckily my troubles were not heart surgery related. But in this picture I was totally freaking out and getting scared because I was in no mood or headspace to deal with any more complications than I already had experienced. My point is that all of us in the fashion blogging community put out multiple pictures a week of life looking oh-so fun and carefree. It's a necessary part of the trade. Whether you're a blogger or a blog reader, remember that so many things could be happening behind the scenes that the camera will not capture. Never compare yourself to someone's sunny disposition because you just don't know what's really happening behind the smiles. Every photo is worth a thousand words, and this photo is proof of that...though not for the most obvious of reasons! Hi Lauren. I thoroughly enjoyed your blog, and truly had no idea any ill health was affecting you. I do remember your hospitalization, but you are correct. One never knows what is happening behind that smile. Well done and be proud. You did a wonderful job with this blog.